Despite being bankrupted twice in his career, John Bell (1745-1831) was one of the most successful booksellers of his day. His British Theatre series included tragedies and comedies, often featuring the most popular, contemporary plays. Bell employed the services of engraver, John Hall (1739-97) and his studio, to embellish his publications. Hall executed the engraving for the frontispiece on the right. It is signed. The frontispiece on the left, however, is not signed and could either have been done by Hall or one of his employees; there are plates throughout the text supplied by his studio. On the left, Britannia sits with her shield and spear, a bearded, winged man kneels before her; on the right, a tragic female figure laments the sinking of a ship. 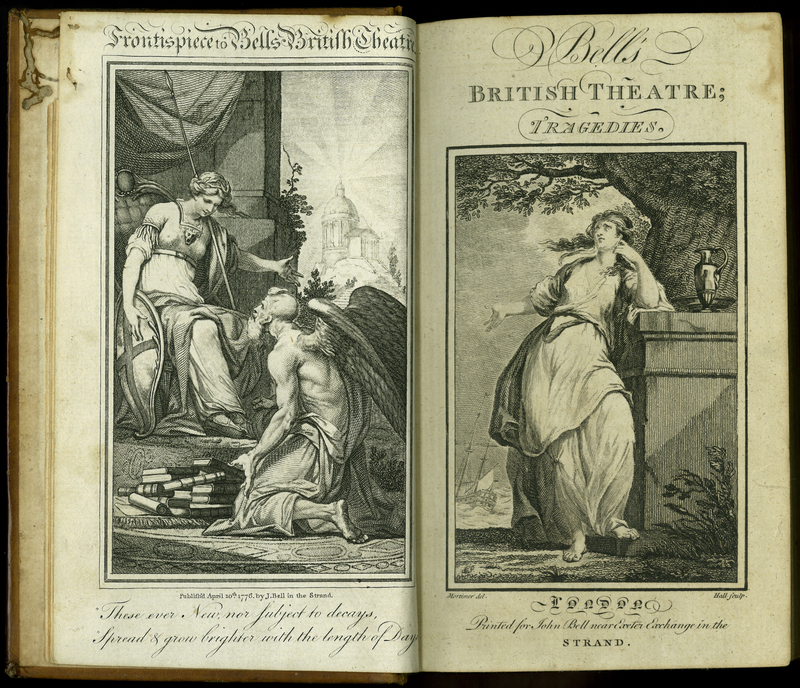 ___, “Bell’s British Theatre, Consisting of the Most Esteemed English Plays,” ourheritage.ac.nz | OUR Heritage, accessed April 24, 2019, http://ourheritage.ac.nz/items/show/10685.